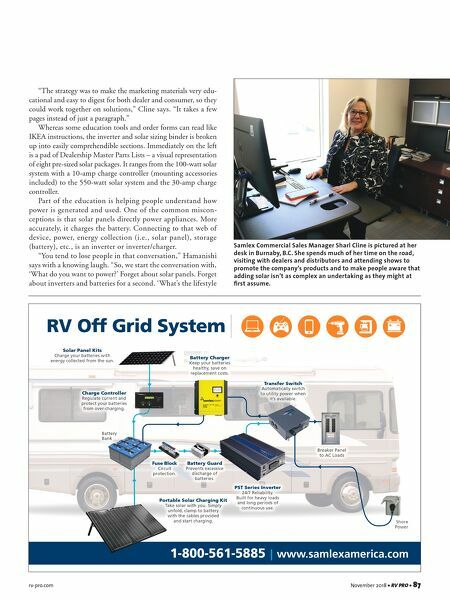 rv-pro.com November 2018 • RV PRO • 87 "The strategy was to make the marketing materials very edu- cational and easy to digest for both dealer and consumer, so they could work together on solutions," Cline says. "It takes a few pages instead of just a paragraph." Whereas some education tools and order forms can read like IKEA instructions, the inverter and solar sizing binder is broken up into easily comprehendible sections. Immediately on the left is a pad of Dealership Master Parts Lists – a visual representation of eight pre-sized solar packages. It ranges from the 100-watt solar system with a 10-amp charge controller (mounting accessories included) to the 550-watt solar system and the 30-amp charge controller. Part of the education is helping people understand how power is generated and used. One of the common miscon- ceptions is that solar panels directly power appliances. More accurately, it charges the battery. Connecting to that web of device, power, energy collection (i.e., solar panel), storage (battery), etc., is an inverter or inverter/charger. "You tend to lose people in that conversation," Hamanishi says with a knowing laugh. "So, we start the conversation with, 'What do you want to power?' Forget about solar panels. Forget about inverters and batteries for a second. 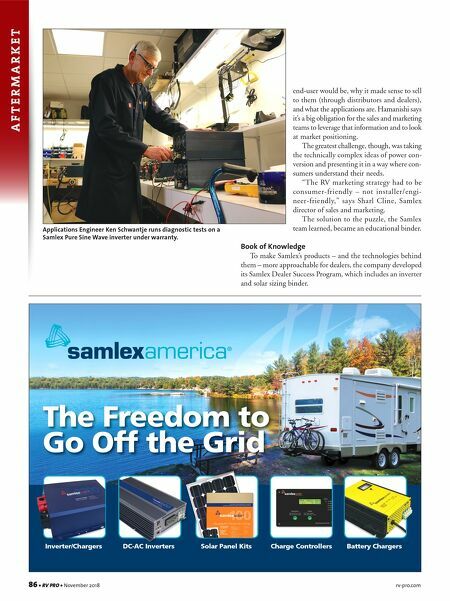 'What's the lifestyle RV Off Grid System 1-800-561-5885 | www.samlexamerica.com Shore Power Battery Bank Battery Charger Keep your batteries healthy, save on replacement costs. Breaker Panel to AC Loads Transfer Switch Automatically switch to utility power when it's available. PST Series Inverter 24/7 Reliability. Built for heavy loads and long periods of continuous use. Fuse Block Circuit protection. Battery Guard Prevents excessive discharge of batteries. Charge Controller Regulate current and protect your batteries from over-charging. Portable Solar Charging Kit Take solar with you. Simply unfold, clamp to battery with the cables provided and start charging. Solar Panel Kits Charge your batteries with energy collected from the sun. Samlex Commercial Sales Manager Sharl Cline is pictured at her desk in Burnaby, B.C. She spends much of her time on the road, visiting with dealers and distributors and attending shows to promote the company's products and to make people aware that adding solar isn't as complex an undertaking as they might at first assume.